The 28-year-old suspect was identified as Ahmad Khan Rahami, a naturalized U.S. citizen from Afghanistan. 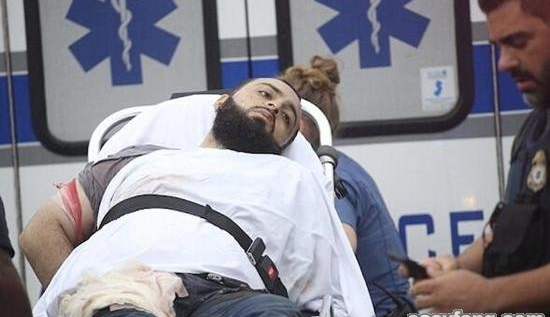 News video showed Rahami being placed into an ambulance Monday in the New Jersey town of Linden, about 32 kilometers from New York City. The suspect's arm was bloody and bandaged and officials said he underwent surgery for a gunshot wound to the leg. Local officials said two police officers were also injured during the operation. The Federal Bureau of Investigation said Rahami was wanted for questioning in an explosion Saturday evening in the Chelsea area of New York City that wounded 29 people. The explosion went off in or near a trash container in a busy area of the neighborhood. The blast sent glass and debris flying into the air. All 29 people wounded were treated and released from the hospital. New York Governor Andrew Cuomo described the Chelsea bombing as "obviously an act of terrorism." Rahami is also a suspect in another bombing that happened hours earlier in Seaside Park, New Jersey, about 135 kilometers south of New York City. Police said a pipe bomb exploded before the start of a charity race to help U.S. Marines. No one was wounded. The FBI and New York police have also been searching for possible links between the Chelsea bombing and another explosive device found a few blocks away that did not go off. That bomb was recovered shortly after the first one exploded. Police safely removed it from the area and set it off in a controlled explosion. Also, five explosive devices were discovered Sunday in a trash can at a train station in Elizabeth, New Jersey, just outside New York City. One of the devices exploded while a bomb squad robot tried to disarm it, but no one was hurt. The bombings happened as leaders from around the world were gathering in New York City for the United Nations General Assembly. A U.N. spokesman told VOA that officials evaluate the security needs each day inside the U.N. complex. There was a gun battle in front of the doorway of the police station yesterday. The bodies were identified as those of two suspected drug dealers. Mr Calder tried to leave the shop but the police officer blocked his path. An explosive device detonated on the roof of the building. 1.The explosion went off in or near a trash container in a busy area of the neighborhood. He cheerfully went off to school. I suppose Carolyn went off with some man she'd fallen in love with. 2.Police safely removed it from the area and set it off in a controlled explosion.